When I was a teenager, it was not uncommon for me to have 3-4 cans of pop every day. Coca-Cola or Mt. Dew were my “drugs” of choice and if I missed out on my daily dosage, I was plagued with painful migraine headaches. At the time I’m sure I joked about these being addictive foods. The truth is – I was addicted to them! Thankfully, I weaned myself off of the soda addiction that kept me fatigued and in pain, but many Americans have not reached this point yet. There are many addictive foods. It’s an epidemic that has struck our country at every stage of life. From toddlers to Prime Timers, addictions to food and sugary drinks is on the rise. Here are the top five most addictive foods and what they do to our bodies. From soda’s to energy drinks and Starbucks lattes, caffeine has become a way of life. Maybe you’ve heard this phrase (or uttered it yourself), “I just can’t function until I have my morning coffee.” Caffeine kicks in within 15-45 minutes of drinking it and the effects can last up to 6 hours. While we may initially feel as though caffeine helps us stay awake, studies show that the health effects of caffeine include headache, fatigue, decreased energy & alertness, drowsiness, mood swings and difficulty concentrating. If you find yourself battling headaches or any of these symptoms, chances are you are hooked to the addictive foods and drinks that contain caffeine. Should you choose to keep drinking caffeine, consider limiting the amount that you have and remember to drink twice as much water as your daily recommended intake. Sugar is one of the most addictive foods. Many researchers have said that sugar is as addictive as cocaine. Unfortunately, it is found in the majority of processed foods, including many breads, ketchup, and the syrups used in those lattes. Sugar has many different names such as fructose and sucrose, to name a few. High Fructose Corn Syrup is a form of sugar that is ten times more addictive than regular sugar. Sugar triggers dopamine, the pleasure controlling chemical in the brain, and while small amounts of it here and there are not a concern, one can become addicted quickly if not careful. The health effects of this sweet ingredient include heart disease, cancer, diabetes, and obesity. Consider reaching for a piece of fruit when you crave something sweet. You’ll be much more satisfied in the long run! Mmmm….chocolate. There’s a big debate whether chocolate is really good for you or not, but there’s no doubt that it belongs in the addictive foods category. Chocolate raises serotonin levels in the brain making you happy. 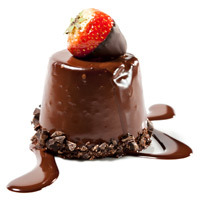 While there are some health benefits to this yummy dessert, eating too much of it can not only be addictive, but risky. Chocolate can trigger headaches, is high in calories and saturated fat, and can lower bone density. The best way to eat chocolate is in moderation, and make sure it is dark. Dr. Sears admits that he enjoys two small squares of 80% or higher dark chocolate several nights a week. If switching from milk to dark is making you cringe, start slowly and work your way up. According to Dr. Sears’ Traffic Light Eating program, cheese is a Yellow Light Food meaning that you can eat it every day in moderation. Look for low-fat cheese that have simply had some of the fat removed, but be sure to check the label to make sure other filler ingredients (like sugar) haven’t been added to compensate for the reduced fat. Even though cheese is a yellow light food, studies show that cheese should be classified in addictive foods because it contains small amounts of morphine that is found in cows milk. It has been calculated that American’s eat about 33 pounds of cheese per year. The health effects of eating too much cheese include migraine headaches, arthritis flares, obesity, and cancer. Instead of stopping cold turkey, choose quality cheeses (like feta or goat cheese) that are low-fat, have less than 10 ingredients, and always eat it in moderation. Dr. Sears says it best: “we need a right-fat diet, not a non-fat diet.” Non-fat foods are addictive foods because when the fat is taken out, so is the taste, so to make up for it manufacturers add processed sugars, enriched flour, and salt. These ingredients not only add extra taste, they also add extra calories. However, they are not very satisfying which leads to overeating and craving more. The health effects of these ingredients include cancer, depression, poor vitamin absorption, high cholesterol, and heart disease. Make it a habit to begin trying healthy fats such as avocados and nuts. They taste better and fill you up much better too! Mandy B. Anderson is a Certified L.E.A.N. Coach and author of the book “In Sickness and In Health: Lessons Learned on the Journey from Cystic Fibrosis to Total Health.” She is the owner and CEO of True Wholeness Coaching where she passionately shares health and faith building tips to thousands of people through weekly newsletters, a BlogTalk Radio Show, and health classes. Her passion for helping others live beyond their circumstances has made her a sought after inspirational speaker and health coach. Mandy lives in North Dakota with her husband, Nate and their dog, Ajah.